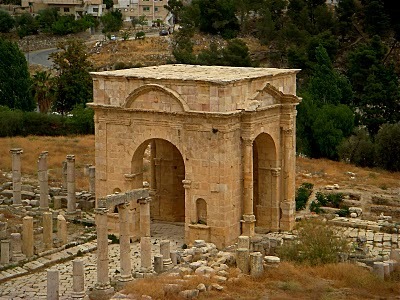 Jerash – The Roman City. 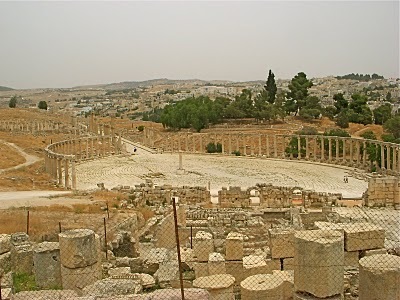 Jerash, the second most visited site in Jordan, is a momentous site of history. 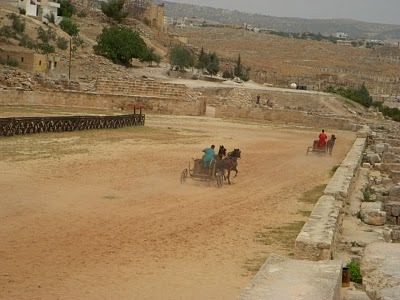 Jerash was a major settlement and city during the Roman period. This area of Jordan has been inhabited by humans for the last 6500 years because of its idea location, and a water supply all year long. After the conquest of Alexander the Great, Jerash began to develop into a sizable town. 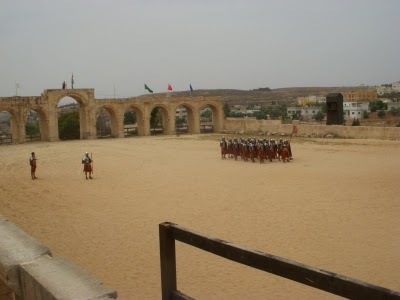 It was during Roman rule that Jerash was at its zenith. In the year of 129 CE, Emperor Hadrian paid a visit to Jerash. The populace built a gate (the picture above), a Monumental Triumphal Arch for their guest – The Emperor. With a population from 20,000 to 30,000 people living within the city, the Hippodrome (the pictures below) could hold 15,000 people at one time, the guests being entertained with chariot races, and gladiator fights. The spacious Oval Plaza (the below picture) measures 90×80 meters that had two altars in the middle with a fountain. From the Oval Plaza, the old Roman Road still paved with the original large stones leads in to the long Colonnaded Street, merchant shops existed on each side of the road. The Temple of Artemis (the below picture) must have been an impressive site and was the pinnacle of Jerash. Artemis was the patron goddess of the city, which in Greek Mythology, she was the daughter of Zeus and the brother of Apollo. There is also a temple of Zeus here at Jerash. The populace of the area would have been able to see the temple from many directions. 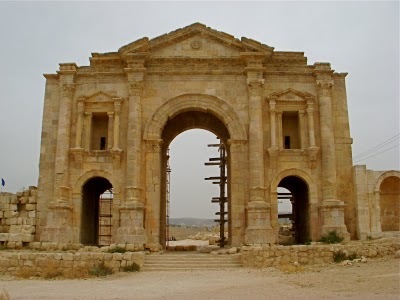 In its day, Jerash was a glorious, beautiful city, of the Roman Empire. In July this area becomes filled with people all over the world for a two week festival that transforms the ancient city into one of the most spectacular cultural events. 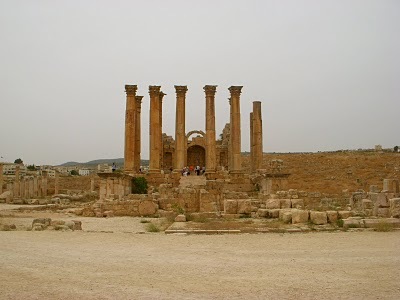 Certainly, Jerash is not to be missed on your tour of Jordan. 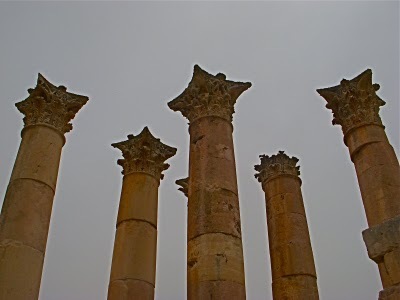 I just uploaded about 80 pictures of Jerash to Shutterfly. Through meeting, talking, and listening to many different types of people, something that I have found interesting is each person reveals different types of desire. By having a listening ear, and a genuine interest in them; the person’s heart will speak. I have come across many different types of mentalities here in Jordan. The majority do express a positive likeness living here in Jordan. There are a few people that have a major conflict living under the culture, and economics of Jordan. Indeed, people with their complaints feel money will make the difference, which it will here in the Arab world; although, true happiness dwells within. The people that I have met that have many complaints believe that grass is greener elsewhere, negativity has engulfed them which their energy expresses. This topic was manifested in Egypt to a greater extent, regardless that there was a few people who made the best of their life in Egypt and found the positive within themselves. Karma creates conflicts, there are many people that have been born into a culture that their spirit doesn’t agree with – living a conflict – wanting what you can’t attain. The individuals that feel enslaved living here in Jordan has been a surprise, owing to the fact, that life in Egypt and other parts of the world is considerably more difficult. For the majority, people seem relatively satisfied living here in Jordan. I have found Jordan to be a very pleasant country. Naturally, the separation of the sexes, with the subject of honor verses shame hanging over the populace, I find to be annoying. However, in the big cities such as Amman and Irbid, observing the young couples in the coffee shops getting to know each other or lightly flirting, I find it to be a very authentic process that is healthy. The university areas of the big cities you can observe more interaction between the sexes. A town like Wadi Musa there isn’t any interaction between the sexes in public – men to the left and women to the right. The reality of the matter is that most people, like other places in the world, express their boredom living the same routine in life; going to work, working all day and going home. Humans like to have a meaningful purpose in life, just take look at the building projects in history. Certainly, the culture itself limits enjoyable public activities and hobbies between the sexes. Nevertheless, this is slowly changing, the question remains – should it change? Most people with a lower monthly income have more complaints in life. Next post: Umm Qais – An Update. Previous post: Into the North – Irbid.